High Blood Pressure: What’s Normal? What to do? Do you know your blood pressure? Both the high number and the low number? And if you do, do you know what it means? Most people can quote their total cholesterol number, but are pretty vague about their blood pressure. And blood pressure is actually more important! First, let me explain the numbers. You know how blood pressure is taken, with a cuff on your arm that is pumped up with air and then slowly released. This “sphygmomaneter” cuff was an invention in 1896; in 1905, Nicolai Korotkov characterized the high and low numbers by listening through a stethoscope to record “Korotkov” sounds. The idea is that when the heart pumps, it exerts pressure against cuff pressure. Nothing is heard until the heart is able to push some blood past the cuff. The turbulence that results is the whooshing sound. You can actually feel it in your arm. The first, “systolic pressure,” is a measure of the force of the peak pressure the heart beat pushing blood through the circulatory system. Then, as the whooshing sound disappears — because turbulence turns into smooth flow — this “diastolic pressure” represents the pressure inherent in the artery when the heart is relaxed. So-called upper limit “normal” blood pressure as recorded in institutions by doctors and nurses routinely is 140/90 mm Hg (the rise of a column of Mercury, Hg in older equipment). 140 would be the systolic pressure at the peak of the heart beat, and 90 is diastolic pressure when the heart is relaxed. This “norm” has been standard for a long time, established by research and panels of experts paid for mostly by pharmaceutical companies. Commonly accepted so-called “normal” blood pressure is 120/80. These numbers are misleading, though. Actual numbers vary a lot by age, weight, geographic region, and ethnicity. What are the risks of blood pressure? What do the numbers really mean? These are important and complex questions. Keep in mind our cautions about the dilemma between correlation vs. causation. Simply seeing a correlation does not necessarily imply causation. There is extensive research measuring blood pressure throughout the world and at different ages. First, lets consider death rates themselves vs age. We all know that none of us is immortal. 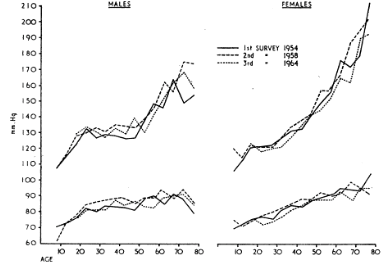 In general, our chance of dying definitely rises with age (once we get past infant mortality). We all die of something! Heart attacks and strokes are very common causes, but there are many so-called “natural causes” of death. Keep this in mind as we think about this. You can see that, in general, systolic blood pressure runs about 100 plus your age. This holds pretty true except in females above age 80. Diastolic pressures start around 70-80 in 20 year-olds, and then increases to around 90 in old age. The reason pressures rise at all has to do with increased stiffening of arteries with age. Just as you notice your joints stiffening with age, the same happens in arteries. When the heart pumps against more elastic artery walls in youth, pressure is lower. As we age and arteries stiffen, pressures go up. This effect is less dramatic for resting pressures. So, there is correlation with heart disease and age, as well as blood pressure with age, and mortality with age. It’s easy to assume that rising blood pressure leads to higher incidence of heart attack, and stroke as well. This would seem to make common sense, right? The next step would be to lower blood pressure and see if it reduces heart attack and stroke rates! 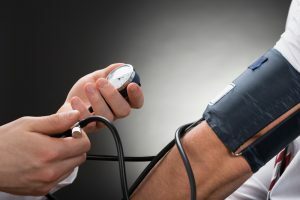 What effect does medically treating blood pressure have? There is evidence that treating the relatively rare patients with very high blood pressure indeed does reduce heart attack and stroke outcomes. That is not controversial. Particularly this is true if diastolic is higher than 105 mm Hg. However, treatment of moderate hypertension in the range of 140-159/90-99 mm Hg shows zero effect in either mortality or rates of heart disease in randomized controlled trials, according to the prestigious (and independent from drug company-sponsored) Cochrane Review. They reviewed a very large number of studies worldwide, involving 9000 people, and found no benefit from medicating moderate hypertensive patients. Moreover, 9% on average stopped medication because of side effects. So cost-benefit is adverse. Consider the physiology. If the pipes are stiffer and drugs lower pressure artificially, less circulation might get to heart and brain, resulting in increased rates of heart attack or stroke. Indeed, the Systolic Hypertension in the Elderly Program (SHEP) showed an increase in cardiovascular events in lowering diastolic blood pressure using medications. Moreover, this showed dose response; in other words, the lower the diastolic response to medication, the higher the cardiovascular incident rate! This response, then, is more causative than correlative! Coming back to general themes in these blog posts, it makes sense that medication is not beneficial and even adverse for mild hypertension. So what can be done in a more natural way? What about low salt diets? There is a huge study on the topic of the correlation between salt in the diet and hypertension. Called INTERSALT, it studied 52 populations in 32 countries. In general, there is a relationship although it varies considerably throughout the world and amongst individuals. It turns out that there are genes that determine “salt sensitivity” variations from one individual to another, and varying in different ethnic groups. More recent and thorough research has shown that an 8% decrease in salt in the diet results in a 10 mm HG decrease in systolic blood pressure. Also, the variability measured with a given amount of salt reduction ranged from – 24 mm to + 25 mm Hg. The best strategy in figuring this out for yourself as an individual is to test it. Simply go on a 1 Gm/day sodium diet for a week or two while measuring your blood pressure a few times a day. Then add sodium back to your diet, and see the effect. If you are indeed salt sensitive, it would be a good idea to restrict salt in your diet. This is not only a matter of not adding salt to your food at the table. There is a lot of hidden salt added to prepared foods as well. Frozen foods and restaurant foods, particularly fast food outlets, add a lot of salt for the sake of taste. How about exercise as a means of lowering blood pressure? Exercise makes a lot of sense in terms of getting back to our caveman-evolved genes, right? Shouldn’t we expect exercise to make a difference? Actually, exercise in many studies has been shown to reduce blood pressure, and cardiac incident rates reduce accordingly in long-term studies. Some studies show a high of systolic reduction by 6 or 8 mm Hg, with diastolic as much as 5 mm Hg in reduction. A large meta-analysis including many studies shows average reductions of -3.8 mm Hg in systolic and -2.58 mm Hg in diastolic. These are modest changes but important when you consider they are averages. [Of course, hypertension is not an acute condition. The blog is providing information for general benefit. Meanwhile, the main focus of the site is to provide a service for acute conditions (meaning temporary, and self-limited). You can use your cellphone or computer to rapidly relief acute conditions DIRECTLY. Suppose you have a headache or fever or diarrhea — or childbirth complications or malaria or typhoid. One of the killer disease in Sierra Leone. High blood pressure is one of the killer diseases in Sierra Leone. Thanks, my friend! These modules, of course, won’t help for chronic conditions, but you will find them useful for acute problems. Thanks! Welcome to any discussion or comments you might have.